WARNING: Spoilers for previous books in the Shatter Me series ahead. Juliette has decided to take down the Reestablishment. In order to do this, she needs help from Warner, someone she never thought she would trust. As she works with him and gets to know him better, she realizes that everything she thought she knew about him was wrong. She has to figure out her feelings for Warner and Adam, and at the same time learn all she can about how to fight because she realizes the only way to win this rebellion is to lead it herself. This was hands down the best book in the series. So good that I stayed up until all hours of the night reading it. Juliette finally turns into the girl we all knew she could be and decides that she is going on the offensive. After Warner saved her life, she starts to see him in a new light and decides to work with him to bring down his father. Warner begins to let down some of his defenses around Juliette, and she finds that he is much different than she had originally thought. Warner definitely showed the most growth of anyone in this book. We finally get to see who he really is under that tough exterior, and he begins to show his true self to more than just Juliette. The more he helps her friends and the more he reveals about himself, the more Juliette finds herself drawn to him and the more confused she becomes about her feelings. I loved the moments between the two of them–they were beautifully written and so full of emotion. But oh man, Adam? After Unravel Me, I was ready to just be done with him. But in this book? He turned into such a jealous, whiny little brat that I had a hard time figuring out why I even liked him back in Shatter Me. Like Warner, in this book Adam’s true colors began to show, but unlike Warner, it put him in a much more negative light. What was great about Juliette though is that she realizes that there is so much going on that is more important than her love life, and she is able to overcome the difficulties she faces emotionally and become a strong leader. Juliette finally learns to control her ability and she learns the many different dimensions of it. Basically, in this book she becomes a super hero. She has grown so much from the first book and she has definitely become one of my favorite female characters ever. She is able to come up with a plan to not only get rid of Warner’s father for good, but to also take over the Reestablishment and change the world. Overall, Ignite Me was one of the best final books in a series ever. I could not have imagined a better ending, and I absolutely loved every minute of this book!! 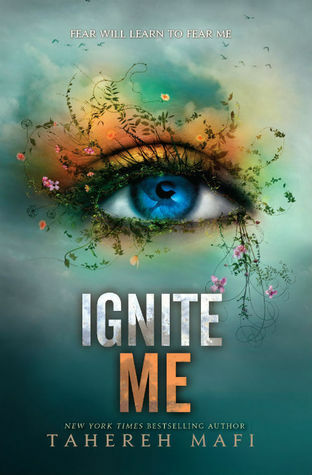 Ignite Me was released on February 4, 2014 and is the final book in the Shatter Me series.